12th, the Second Sunday of DECEMBER, 2010. From the marvelous sea beach resort of Mahabalipuram to Rustic Village Ambience of Surjivan, then we traveled caves Guhantara - for a riveting stone age experience. From there we Eskimos, when we met at Hyderabad at -5 degree centigrade. There is lot of hot bargaining going on the UPSs, Every tender is quoted by many and under coated by many, the industry is hot, companies fuming at one another. I am very much aware of what is happening around. So we decided to bring you all together to this hill resort of Khandala, to forget the differences for a day atleast and submerge in the serene, picturesque surroundings of Khandala Ghats to have fun, frolic and off course some serious discussion. Best in Product quality & After Sales Service in SD’s USERS’ Satisfaction Survey, 2010.
to Mr. R Chellappan, CMD Numeric and his team. Online UPSs in Product quality for all ranges in SD’s USERS’ Satisfaction Survey, 2010.
to Mr. Pradeep, MD DB Power and his team. 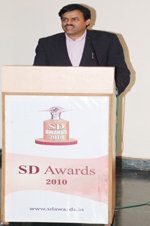 Piller brand of UPS Systems was adjudged SD’s No. 1 in Dynamic UPS Systems category while AROS brand of UPS System was adjudged Best for Product Quality in 3 Phase UPS Systems above 100 kVA ratingsin SD’s USERS’ Satisfaction Survey, 2010.
to Mr. Mahesh Mestry,Manager (Sales & Service) PCI Limeted. Consul’s Megaline series of Online UPS upto 200 kVA category has secured 91.5% satisfaction level with A++ ratings in SD’s USERS’ Satisfaction Survey, 2010.
to Mr. Ghanshyam Bhagel, Consul. SD’s No. 2 Offline / Line interctive UPS Manufacturer of the Year. 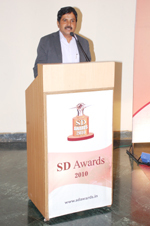 Uniline has been adjudged Best in terms of After Sales Service & Best in Technology Advantage vis-a-vis Cost Effectiveness for Single phase online UPS Systems in SD’s USERS’ Satisfaction Survey, 2010.
to Mr. Kamlesh Patil(Regionel Manager), Uniline. Hirel I4 Brand Of UPS Systems have been adjudged having A++ satisfaction levels in SD’s USERS’ Satisfaction Survey, 2010.
to Mr. Ganesh Shinde, Sr. Engineer-Sales, Hi-Rel. TECH UPS brand of Online UPS System (Single Phase) has been voted best in terms of product quality in SD’s USERS’ Satisfaction Survey, 2010.
to Mr. Narayan Sabahit, MD & Mr.Ganesh G. Sabhahit, Director Techser. 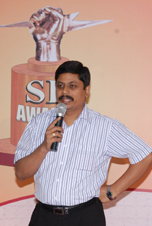 Powerone’s single phase UPS System has been voted as best in terms of technology advantage vis-vis cost effectiveness while all UPS products form Powerone have recorded “A++” rating in SD’s USERS’ Satisfaction Survey, 2010.
to Mr. M R Rajesh, Director, Powerone. HYKON’s - AETS - AETS 50 Online IGBT Single Phase was adjudged best in terms of Power Quality while HYKON’s - AETT3-AETT200 Online IGBT 3 Phase-3Phase UPS System was adjudged best in product quality vis-à-vis cost effectiveness in SD’s USERS’ Satisfaction Survey, 2010.
to Mr. R N Kiran, General Manager, Hykon. Microtek has been adjudged best in After Sales Service for all types of UPS & Inverters having A++ satisfaction ratings in SD’s USERS’ Satisfaction Survey, 2010. 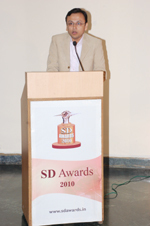 Award being presented by Mr. Pradeep Pimpley, Managing Director DB Power Electronics. 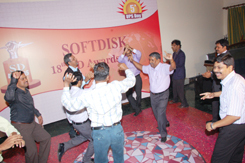 to Mr. S K Kaushik, Zonal Manager, & Mr. Rishab Jain, Manager Sales, Microtek International. SD’s No. 3 Offline / Line Interactive UPS Manufacturer of the Year. 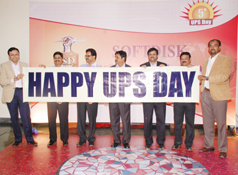 SPECIAL brand of line-interactive UPS Systems have been voted best in terms Product Quality in SD’s USERS’ Satisfaction Survey, 2010. 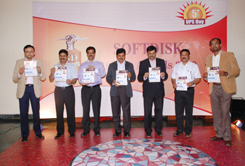 Mr. Ciju K Raj, Sales Head (Power Solution Business) & Mr. Deepak Ramesh Regional Business Head, WeP. 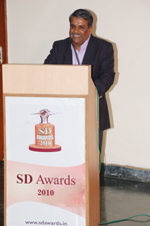 in SD’s USERS’ Satisfaction Survey, 2010.
to Mr. Hariharan Balsubramanium, Country Sales Manager, APC SCHENEIDER. Zoom View Eaton’s PW9390 (Three Phase) Modular UPS was adjudged the Best for Product Quality of Online UPSs upto 200 kVA & Best in After Sales Service for its entire range of products in SD’s USERS’ Satisfaction Survey, 2010.
to Mr. Sangram Ghadge, Regional Manager - (West), Eaton. won 92% “A++” satisfaction rating in SD’s USERS’ Satisfaction Survey, 2010.
to Mr. Tejas Sheth, MD, Asia Powercom & his team. DELTA INDIA ELECTRONICS PVT. LTD., Gurgaon. 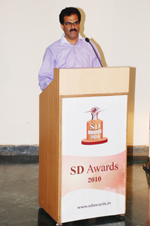 product quality of Online UPSs upto 200 kVA in SD’s USERS’ Satisfaction Survey, 2010.
to Mr. Anand Nayak, Regional Manager, (West), Delta & his team. Zoom View POWERNET G-TEC brand of (Single Phase) Online UPS Systems registered 93% satisfaction level with “A++” Ratings in SD’s USERS’ Satisfaction Survey, 2010. Zoom View The company has registered “A++” Satisfaction Ratings in SD’s USERS’ Satisfaction Survey, 2010. 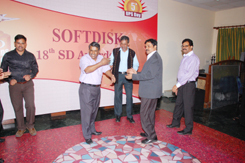 Award being presented by Mr. Hariharan Balsubramanium, Country Sales Manager, APC SCHENEIDER. to Mr. Rajaram Rammoorthy, MD, E & C.
Zoom View Cosmic Micro Systems registered “A++” Satisfaction Ratings in SD’s USERS’ Satisfaction Survey, 2010.